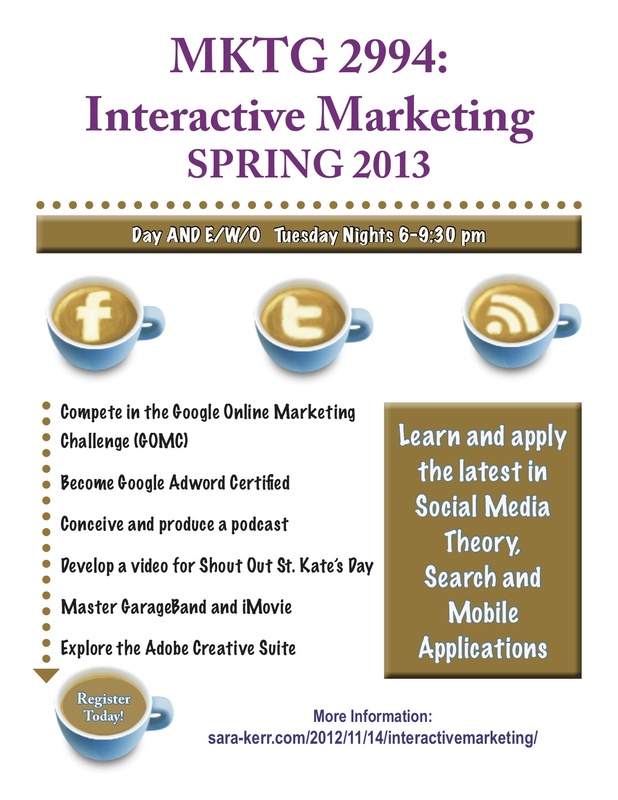 Given that I love social media and teaching, I’m excited to launch a new course at St. Catherine University spring semester: Interactive Marketing: Social Networks, Multimedia, and SEO. This class is open to both traditional Day as well as Weekend college students. It meets on Tuesday nights from 6-9:30 pm. I guarantee no one will be bored. Interactive Marketing: Social Networks, Multimedia, and SEO examines Internet marketing activities used by all industries in for-profit and non-profit models to advertise their brand, interact with customers, and ultimately convert searchers into buyers. This course focuses on four fundamental areas of interactive marketing: Search Engine Optimization (SEO), multimedia technologies such as graphic design, audio and video production; social networks, and mobile computing. NOTE: This is a small, technology intensive class. There are only a few spots left. If you are interested, please register today. And please do contact me with questions. Thanks! I’m counting on having Ed come speak for it too, if he’s open to the idea. Plus at the end of the term, I’ll have a whole slew of intern options for you! I do not even need any more electives but I think this would be an amazing class. I’m going to try to register, hopefully it isn’t full. Any chance I could audit the class?